Bhushan Steel today reported Rs 141.63 crore loss in the first quarter of current fiscal due to higher expenses and finance costs. 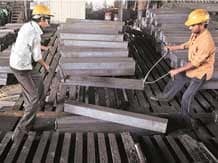 The company, which has three plants with a cumulative steel-making capacity of around two million tonnes per annum, had clocked Rs 76.26 crore net profit during the same quarter last fiscal, it said in a statement. Total income from operations rose to Rs 2,802 crore from Rs 2,491 crore a year ago. Expenses of the company also went up to Rs 2,393 crore from Rs 1,987 crore a year earlier. Finance costs zoomed to Rs 552 crore from Rs 403 crore. Shares of the company fell by 9.98 per cent to settle at Rs 177.75 apiece in the BSE today.